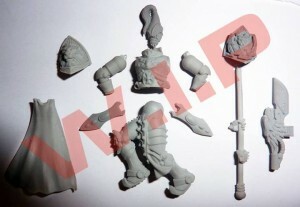 Kabuki Models is showing off a preview of the pieces for a new Tiberius Praetorian model they're working on. no more a single model but a full modular army!!! take a look at the teaser... who they are? What they do? Let's say there were created more in an ancient time by the will of the Emperor Tiberius and that their symbol is the Scorpion, they're the inner guard of the Emperor himself! The most powerful man in the Roman Empire need the most powerful guards... what? They look as sci-fi models? Well...who told you that the Roman Empire is dead? We are still working on them, it's about the last finishing and fixing, hopefully in the next 10 days you will see the definitive model.